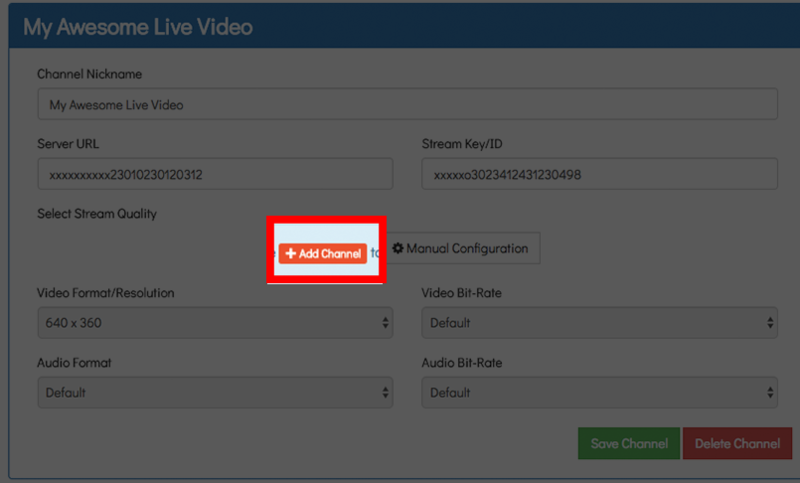 Switcher Studio users can easily manage streaming channels online via their account dashboard if they are subscribed to the Professional Plan. To get to the dashboard, log into the Switcher Studio website. Do this by clicking on the "login icon" in the upper right or by clicking on this link. Use the same email and password that you used to create your Switcher account. On the left, choose "Custom RTMP". At the top click on "Create New Channel". Give the channel a name and enter the Stream Key and Stream URL provided by the video player to which you are sending video. Click the "Speed Test" button to run a speed test and automatically pick the best quality for your stream. 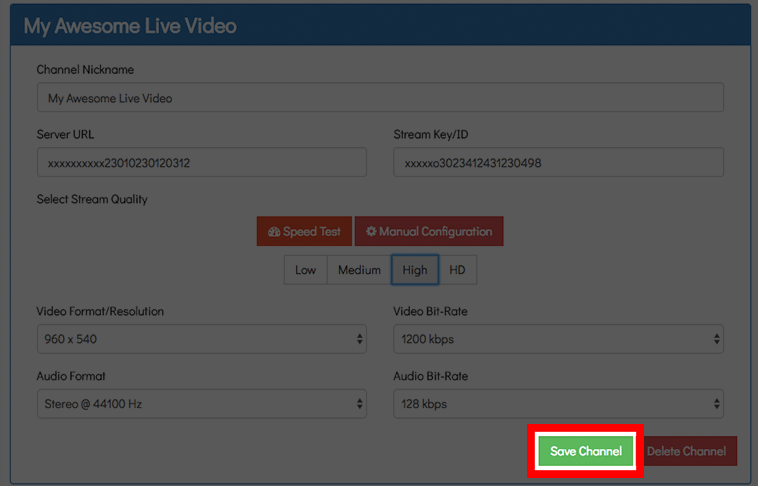 If you prefer to choose your own settings, click on the "Manual Configuration" button to select a Video Resolution and Bitrate for your channel using the dropdown menus. 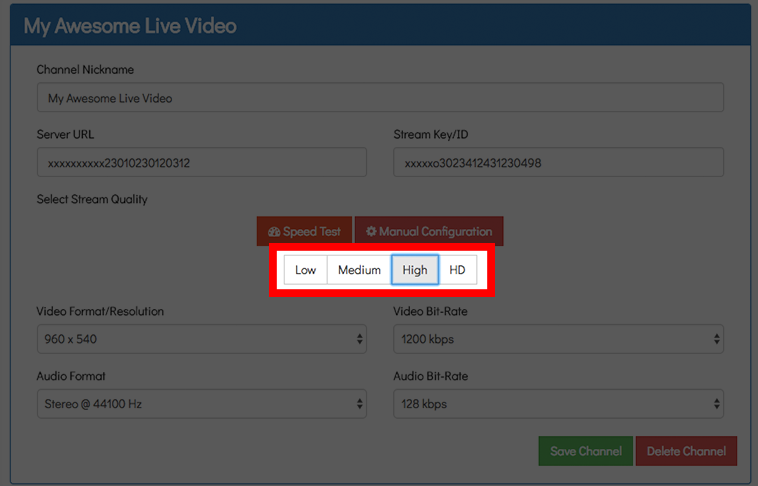 You can manually adjust the Video Resolution and Bitrate to optimize your stream based on the quality of your Internet connection. 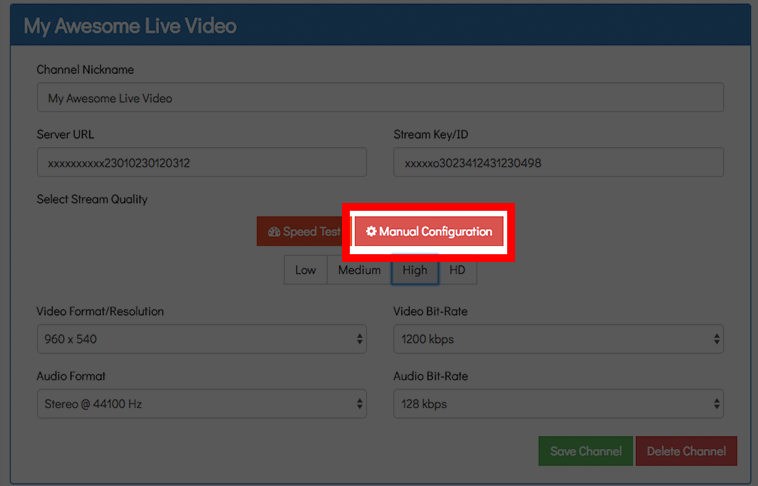 You may also configure these values automatically by selecting one of the presets in the "+Add Channel" dialog window under the "Manual Configuration" options. When you have finished creating and configuring your new channel, click the "Save Channel" button. 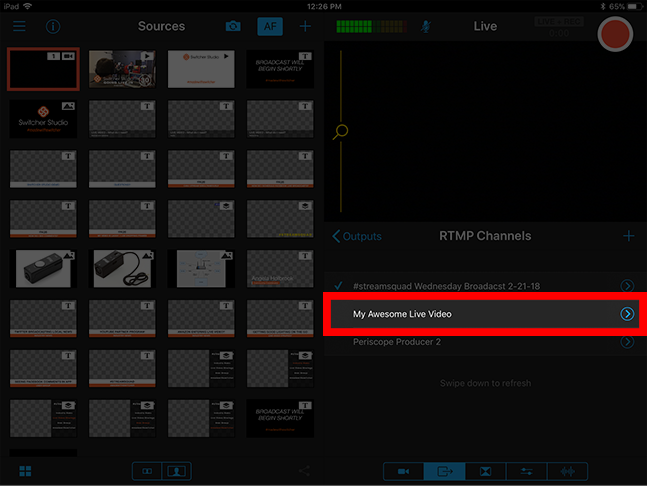 After saving, open Switcher and tap on the blue arrow to the right of the "Custom RTMP" option. Swipe down on the menu to refresh your channels and sync the app with your Switcher Studio dashboard. You can now select your newly created channel. 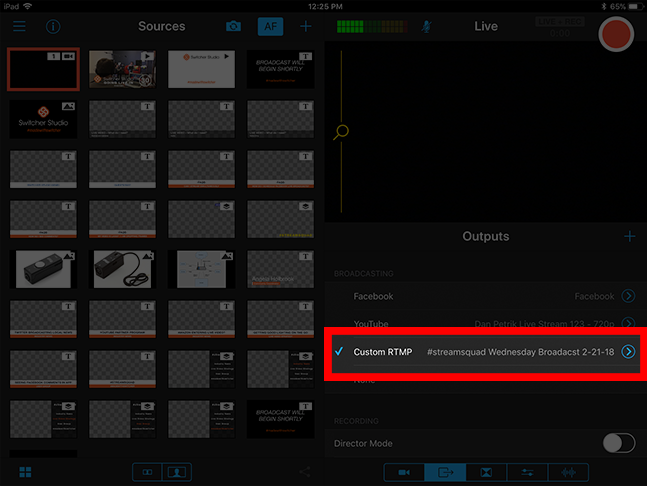 You may also add channels within the app by tapping the "+" icon within the "Outputs" menu. Channels created within the app will also be synchronized with your online dashboard. Likewise, any channels deleted from either location will be deleted from the other location whenever the app is synced with the dashboard.